Andrea and her family breed, train and compete champion bird dogs. She realized that because of the desert temperatures and terrain in their area, they needed a balm that would protect and heal puppy and cat paws. She created Dog and Cat Paw Wax. The recipe uses oils, Shea butter and another ingredient. In the “Notes” section she recommends some additional skin-healing herbs that can be used to infuse the oils.The recipe is super simple. The balm can be used before your dog or cat is exposed to very hot or cold weather outdoors. Where I live it can get very cold in the winter. There are “booties” for both dogs and cats but I’ve never seen a pet wear them. This paw balm is much more practical. 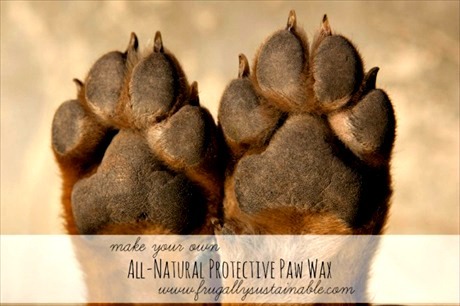 Click the How to Make Your Own All-Natural Protective Paw Wax for Dogs & Cats link below to see Andrea’s recipe for Paw Wax. After reading the introduction, click on the “How to Make Your Own All-Natural Protective Paw Wax for Dogs & Cats” link at the bottom of the introduction. You’ll be brought to the full article. I’d like to make this without beeswax, could I just increase the shea butter? Or use cocoa butter?